Not my words, the real estate agent’s… And this gracious description accompanied by bright and airy photoshoped images obviously went some way in selling the unique residence… Late in 2015 the house at 580 Forest Rd Bexley known as ‘Brandlesome’ traded at auction for $2.77 Million. It was owned by the Formby family for four generations prior, but unoccupied for many years and as a result both cocooned as a period time capsule, while also showing some signs of decay such as rising damp that inevitably result from such lack of use. Brandlesome represents an outstanding example of Federation architecture that has rapidly disappeared from the local area. The building exhibits some fine ornate features consistent with the era, including herringbone brickwork, high chimneys and terracotta features, and those wonderful lead light windows that worked as a selling point for the real estate agent… Even rare examples of half-timber work are present, and this is not seen on many local Federation buildings. Additionally, the very layout of the building is unique, being transversely designed, with a central front porch and large looping ‘keyhole’ arch. This is highly unusual among the regular rectangular or square shapes of Federation housing common of the time. The fact that this house has been owned by four generations of the Formby family adds immensely to the heritage value for the local community, not to mention the original front boundary fence and the fact the house is basically complete and unaltered over the decades as many others have been. All this would point to local heritage listing. But there is none. Naturally a certain sense of speculation surrounded the future of Brandlesome when it was put on the market after being tightly held for so many years. But all bets were off just a short time after when a DA was presented offering complete demolition of the Federation beauty, subdivision into three land parcels and construction of three separate modern ‘superdwellings’. 580 Forest Rd. Three oversized boxes proposed to replace one heritage marvel. DA image by ZTA. The development would be acceptable IF it didn’t involve destruction of a historic building. DA image by ZTA. This could be seen as ‘very disappointing but very predictable’– words used by St George Historical Society president Bernie Sharah to describe the somewhat unsurprising outcome… Old house, big block of land, development biased council? We have seen it all before. But one question still has to be asked, and that is this: Can this house be saved, and can it be saved while still making the new owner some financial gain? 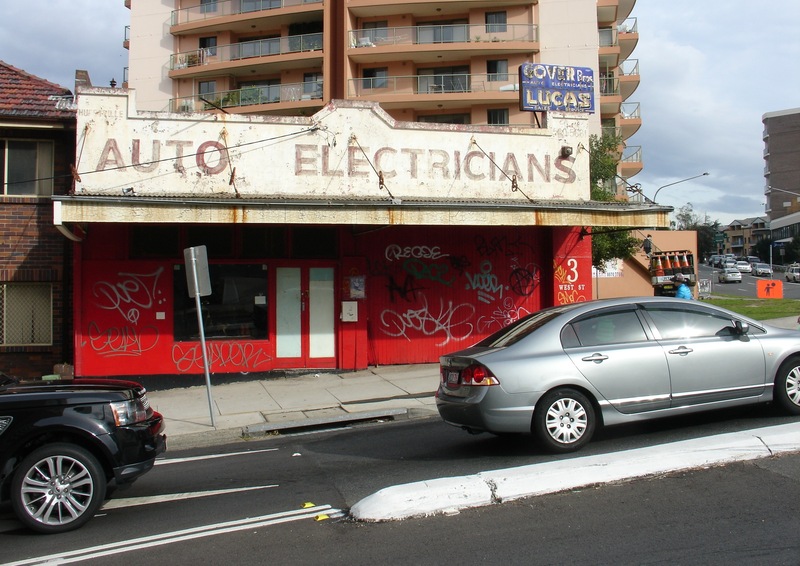 It has happened in other council areas such as Marrickville, whereby the development controls have been slightly altered to allow retention of the heritage property while adding value to the land by allowing more development in the surrounding parcel. In the case of Brandlesome, being slightly off centre on a large 2000 metre block of land, townhouses could be substituted down one side and along the back in an L-shape around the existing building, offering a better range of housing, and potentially increased profit for the developer, while most importantly retaining the heritage item. This can be seen as a successful alternative to complete demolition, and one that offers a win-win-win situation by allowing the developer to increase their financial return, Rockdale Council to set a new standard for heritage retention mixed with quality new construction, and of course community benefit by preserving an extremely important piece of local heritage. Far too many unique iconic houses are being lost in the area, as can be illustrated by another recent announcement that historic Halstead House in Mortdale, the oldest building in a heritage listed precinct, will be demolished in exchange for two modern dwellings. The owner says he doesn’t want to live in a heritage home, but then he should move out and leave it for somebody else. The reality is he wants to make a profit from the size of his land. And he certainly isn’t the first nor will he be the last. This will go on and on until many of our historic homes are lost. Another St George grand home to go, Halstead House, which was removed from heritage listing in 1999. Image Fairfax Media. And that is why we need councils such as Rockdale to act creatively, to work with developers for best results, to be strict and consistent with guidelines, and to put local heritage retention at the forefront when determining DAs. This isn’t happening at the present time, but we need it to, as the stakes are so high. Heritage only gets one chance. And houses like Brandlesome are way too precious to sacrifice for the financial gain of single owners who came in at the last minute just to turn a profit. That is no way to treat our architectural assets that mean so much to us all. The fate of Brandlesome rests with Rockdale council. This is now a litmus test to see if a local council has the will to ensure survival of its historic buildings. The new owners have already decided to neglect their building, filling it with bags of rubbish, leaving the windows wide open and the lights on day and night. But not all is decided, and there is still time to write a letter of objection to council, or a quick email to rcc@rockdale.nsw.gov.au (quote Ref Number: DA-2016/137). Images above by Ray White Real Estate. Title image Inheritance 2016. There was a time when industrial buildings were seen as ugly, void of beauty, unsightly, uncharming. In many circles that may still be the current held point of view. I myself have stumbled over enough examples to contradict this, many of which are disappearing from our cities’ urban landscapes, as entire swathes of post-industrial precincts are rezoned quickly and easily in exchange for the current boom crop of large scale high density apartment building. Not much ends up remaining of these monuments to our past…these warehouses, these workshops and factories, these theatres of industry where generations of workers plied their trade amongst the grit and the grime, many laboring for minimum wage, forging the products of our times, the wealth of this great nation, in a proud and honest period before we decided it was all much easier to just get things made in foreign countries and shipped over by the container load. Indeed it appears that the bundy clock of change has swung on our entire manufacturing culture, no signs more poignant than the impending shut down of our automotive manufacturing industry, and hot on its heels the dire state of the local steel making industry. Or the textile industry, the paper milling industry, or the print industry, where even our Yellow Pages as from next year will be printed in China and shipped all the way to our shores individually shrinkwrapped to be delivered to our doorstep where most of us will faithfully pick them up and place them directly into the bin. The recycling bin at least. I diverge, but it has become almost farcical, the whole notion of an Australian manufacturing industry. The penny will have to drop at some point, surely, when our current fortunes fade, the builders put down their tools and we realise, all of a sudden, that there really aren’t enough jobs in this country for the endless swarms of people we seem to be importing. But all that will come… I want to talk more of what has been. To focus, perhaps, on an example of what we are trading in. A sample of building style that to our children may not be easily recognisable, as it is not, and never was, deemed important enough to keep. Both in structure and in spirit. There is a shop, on Bourke Road, among the old warehouses, and modern residential blocks that every day seem to be mushrooming around and elbowing any lowrise competitors out of the light. In an era of mass-produced flatpack Ikea plantation particle board this place is a dinosaur, and the time has come when it has closed its doors for the last time. The shop, a family business known as Doug up on Bourke, has traded for the last 13 years, and modeled itself as a veritable treasure trove of industrial antiques, housing anything and everything from the 1800s through the 1900s, from cast iron postal boxes to Department of Education furniture. From beaten up tin railway signs to army medical stretchers. From naval matériel to WWII navigational equipment, and from advertising articles to golden age of motoring paraphernalia. It’s all here, in spades. And the building itself, this old brick warehouse, is a fitting tribute to the enduring purpose of industrial relics. An ideal stage for the show to unfold. With saw-tooth corrugated iron roof propped up by thick cedar beams, exposed brickwork flaking decades of hard worn paint, reinforced window slats that let in some of the light and some of the rain, as a galvanised bucket readily welcomes leaks from the ceiling. The upper floor with its solid timber floorboards winds around and leads to a back room and stairwell down to a lower cavernous workshop. An antiquated hydraulic service lift still operates between the two levels, bringing up carpenters’ workbenches or helping to despatch metal pigeon holed filing cabinets marked SRA. Wandering round the piles of relics, it quickly dawned on me that it is a sad indictment on our city and its people, not only to be losing a such a wonderful old world shop such as this, but also to be eliminating buildings like this from our social fabric altogether. It’s disturbing, that future generations won’t be able to walk in off the street and see places like this, in all their full post-industrial glory. These buildings are becoming, like our manufacturing industry itself, a thing of the past. Many more like it are being torn down in a flurry, like the Porter’s Paints building next door. In fact the entire block including the massive Lawrence Dry Cleaners is earmarked for destruction. The surrounding suburbs of Waterloo and Zetland and areas like it are completely removed from what they were just a short time ago. And in order to imagine the future one need not look further than the nearby AGM Glassworks site. What is actually left of the once sprawling industrial complex? Just one chimney, a few rotten turbines and a couple of admin buildings… Or the former CSR sugar refinery at Ultimo, which had its own power station, of which nothing remains. Highrise has erased most traces of our industrial past. These vestiges are all being torn down and wiped out one by one, in the space of a few years, denying any clues that Australia even had a manufacturing trade at all. But when the kiddies decide they want to look back in several years time and picture the kind of city their parents grew up in, they should know this: We did have a manufacturing industry once, that boomed over a series of decades, and was of world class standard. And of that we should be proud, and deem it an integral part of our heritage and social inheritance, not something that as politicians believe should be swept under the carpet, something that simply gets in the way of our current portfolio of economic retardation, that of importing people, and rushing to build canyons of concrete to file them in. What comes after that seems to be of no consequence to the current trend of government, but this also comes at the expense of the heritage of all of us; of the heritage of this great working city and great working country. Cows ahead. Or maybe highrise ahead? This is what is rising in the ashes of industrial suburbs. Doug Up on Bourke closed its doors on 2nd October 2015. What remained of the collection was sold off over the course of three days of gruelling auction. Doug, his daughter Sophie and son-in-law Craig have moved out and on to other ventures. Thanks for running what I consider Sydney’s most interesting shop, and goodbye. I recently had the privilege of rummaging through an old Art Deco cottage that had been sold at auction as the result of becoming a deceased estate. While the house was traded for an inconceivable amount, purely due to its land value alone, and will inevitably be bulldozed in the longer term, what I found inside was a veritable time capsule of that era, one that still retained many of the original installation furnishings and fixtures, including doors, light and bathroom fittings, masonry and tilework, even what were probably the original carpets and mattresses still in good condition. Bank vault doors still kept guard with heavy chromed handles. Magenta heirloom rosebuds looked up from vibrant carpets underfoot while emerald ivy climbed the halls across sheets of crisp wallpaper. Frosted spectacular triangle shapes pierced the windows like leadlight icicles. Jade ornaments bedazzled the bathroom between geometrical tiles like carved Maori offerings. Organic flying saucers filled the corners of the rooms with their soft yellow glow while an original Smiths Sectric Durban clock kept time upon the wall as it had done for decades. As I took it all in I could only stand in awe at the level of workmanship and decoration that was crafted into these dwellings of the period, and was left pondering the question “why are we knocking down so many of these wonderful and graceful buildings only to replace them with cheaply built and unremarkable alternatives?” The answer still makes me feel dumb. Inside the house there was an air of regality that I knew now could not endure, not with new owners, not in this day and age… The former owner, over 90 years old, saw no reason to change things. The new owner –any new owner– nowadays, will want to put their own stamp on their possession and customise things to their liking, breaking the entire synergy of the long held original. A novel feature, three layers of cutting boards built in to the kitchen. Smiths Sectric Durban, produced from 1937-1966. An amazing production run of three decades. Matching balustrade and driveway gates. Sydney is disappearing… The city we know and love is being lost before our very eyes, sold off and torn apart, opened up and ripped into pieces. Inheritance the blog was created to document this change and show some of the things we are losing across our city and our state. Inheritance Society and NSW Heritage Network were incorporated to allow like-minded individuals to come together and share their collective views and work towards turning the tide around. Disappearing Sydney has now been created as a Facebook group to share photos and alert people visually to the loss throughout their own areas. If you have a camera or a smart phone, you can be part of this group and make a contribution simply by uploading your own photos of buildings and places that are disappearing, sharing them with a wider audience. It is not fair nor right that our city is being treated this way. Much of the high-rise development that is being pushed by local and state governments is a direct result of offshore foreign investment. Our state government in particular are willingly selling off prime assets and promoting NSW as being ‘open for business’, indulging in high density building frenzies and population growth spurts just so they can stand tall at the next election and claim how viable the economy has become. But we have our eyes open. We are weary of the fact that they have become addicted to excessive residential building as a tool for injecting large scales of money quickly into the economy. We are aware that they have created an artificial housing boom by promoting foreign investment into exclusively new building projects, a boom that has left many of our next generation of Australians wondering how they will ever be able to afford their own piece of the pie. We are aware they have watered down heritage and environmental laws to allow full exploitation of real estate potential across the state. And we are aware that our society and our lifestyles are being irreversibly altered and constantly threatened by this excessive race to grow the economy at all costs, in the most aggressive way possible, not by creating new industries and fostering smart technologies, but rather by simply injecting more people and pushing more concrete into the sky. So much of our heritage is being lost to the building boom and we are constantly watching priceless treasures disappear forever, denying future generations a sense of place and perhaps a sense of understanding of our cultural identity – the visual links of layers of architecture laid down over decades. All this disappears every time a developer decides to buy up in an area and flaunt lax heritage laws by bulldozing everything within site. Like great trees in the forest that have taken many years to grow and only a brief minute to cut down, so too are our heritage assets so carelessly sacrificed. And what remains is merely a testament to the greed of rapid economic expansion at any cost. What we are left with is an altered sense of culture and identity, a collective mindset that is severed , one that has difficulty reconciling the place of its own heritage in a rapidly changing world. What governments often try to make people forget is that all of this is also completely unsustainable within the context of life on this planet over the coming decades. 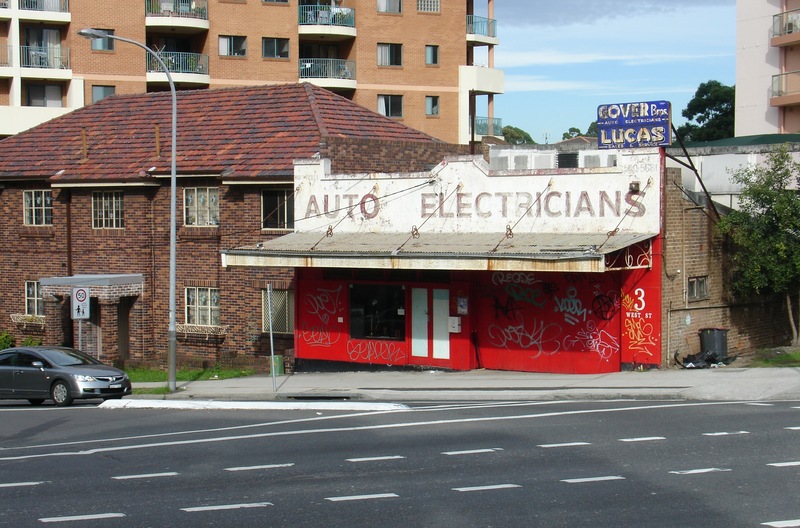 I’ve always admired this Auto Electrical workshop at 3 West St. South Hurstville. And every time I drove by recently I was almost expecting the worst (some of you heritage die-hards would know the feeling)… So I cringe to think who could go out of their way to try and ‘modernize’ such a classic and unique piece of Australian automobilia heritage, just as this type of genre is coming back into rage. 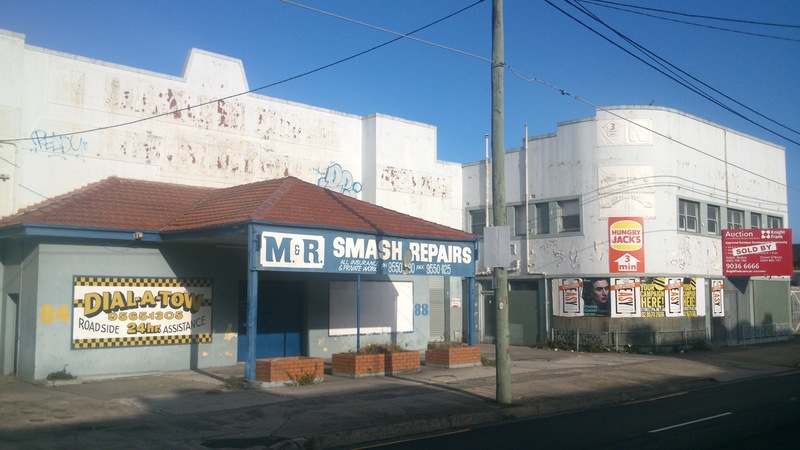 I ignorantly assumed the building was locally-listed (or it would have been gone already by now), but have since been informed otherwise by Kogarah council. So I guess I should be thankful it still holds its place at the top of the hill… However it confuses and astounds me that the owners would choose to remove the fixed awnings, the workshop doors, the advertising signs and street lettering, and alter the colours to some ugly non-relatable paint scheme – almost everything that made it an automotive workshop in the first place is gone. Now instead it looks like some disused army barracks trying hopelessly to resemble a modern office space. What a total failure on two counts – the obvious and clear willful neglect of heritage attributes, and the badly attempted rebirth imitation of a building into something it is clearly not. More on the mark would’ve been an outcome that reflected the original features of the workshop. 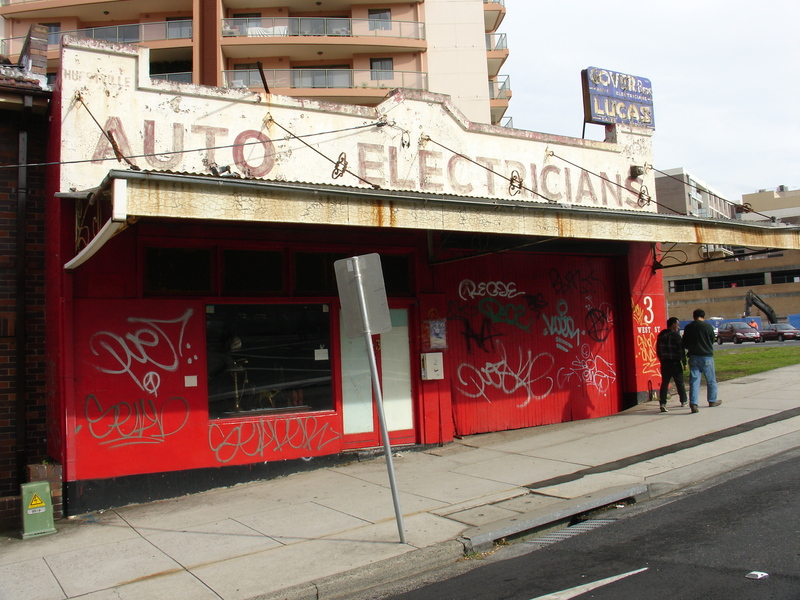 A café would work, a showroom of sorts, retail, (an auto electrician would you believe? ), anything really that pays homage to the structure and heritage of the site. It’s a simple recipe that we fail to abide by time and time again. Normally the excuse is the overruling ‘need’ for highrise but that is not the case here, this is just plain dumb. So, we still have the heritage building, but what is missing here? Everything that makes it a heritage building, more or less. If you are a lover of Art Deco as am I, you may be slightly miffed by the loss of one of Sydney’s only remaining original 1930s full service stations. If you have been swayed by the Petrolmania craze that has taken over our televisions you may be a little saddened by the closure of one of the last purveyors of oil from glass bottles and classic automobile nostalgia. And if you are simply a fan of good old-fashioned driveway service you may just miss the welcoming sight of the Salisbury Service Station at Stanmore for it is about to be wiped from our motoring maps and minds forever. You certainly won’t miss the rising concrete frame of yet another block of boutique apartments with an overzealous moniker, this time known as ‘The Radius’, perhaps as some kind of bizarre lip service homage to the semi-circular floorplan of the Art Deco structure it is destroying. The family-run business is set to shut up shop and leave the Percival Road location it has graced since 1930, having being sold to a developer who will make full use of the prime inner west location and valuable crossroads pocket of land. Owner Norm Iacono. No wonder he’s smiling. Image Daily Telegraph. Current owner Norm Iacono doesn’t seem to be all too upset with the outcome. He took over the reigns from his grandfather in 1997, ran the shop for several years and is now happy to be moving the business to Summer Hill while selling the Stanmore site for a king’s ransom. Pointing the blame at higher running costs due to petrol storage laws, his comments to media that “A lot of people come in and say what a great building it is, but the building was built in the 1930s, so there is no real significance for architecture” initially struck me as slightly odd for a small business owner who has traded not only in petrol but also nostalgia for so many years. After all, you don’t see too many Art Deco service stations from the golden era in such original unchanged working order. But when you consider he is set to benefit financially by the full demolition of the site you can see how quickly nostalgia is pushed to the side like some old rattle gun that has come to the end of its useful life. The vintage oil bar at the Salisbury still in use, but not for long. Image Daily Telegraph. Norm is hopeful however that the developer will pay some sort of tribute to the heritage of the site, by displaying the oil bar near the entrance to the restaurant or something to that effect… It could have a Model T Ford parked in the foyer for all I care, it will still be just another oversized concrete box with a Model T parked in its foyer. There is simply no substitute for the original item. It would have been nice to retain at least the drive-through frontage part of the structure and re-purpose that as an outdoor cafe – I mean, we are talking a matter of a few square metres for pity’s sake, would it be so hard to retain at least that much heritage within the total area of the site? 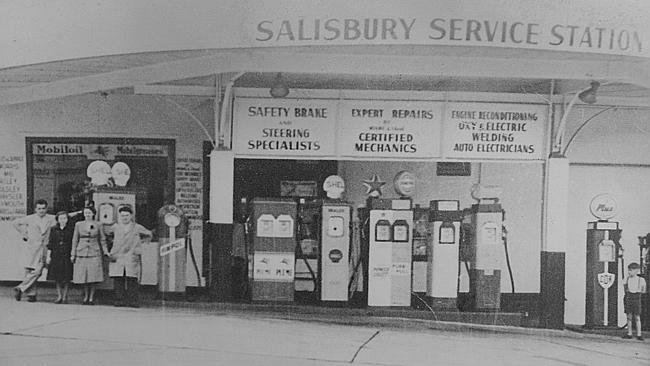 A 1951 photograph of the Salisbury service station. Image Daily Telegraph. Unfortunately this buy-up of prime service station sites across Sydney is not confined to just this fine example. It is happening all over and many old independent stations are being bought and converted into apartments as developers fight to get hold of these prime main arterial slices of land. Among others, another Art Deco workshop at Princes Highway Tempe recently closed and is slated for residential redevelopment. 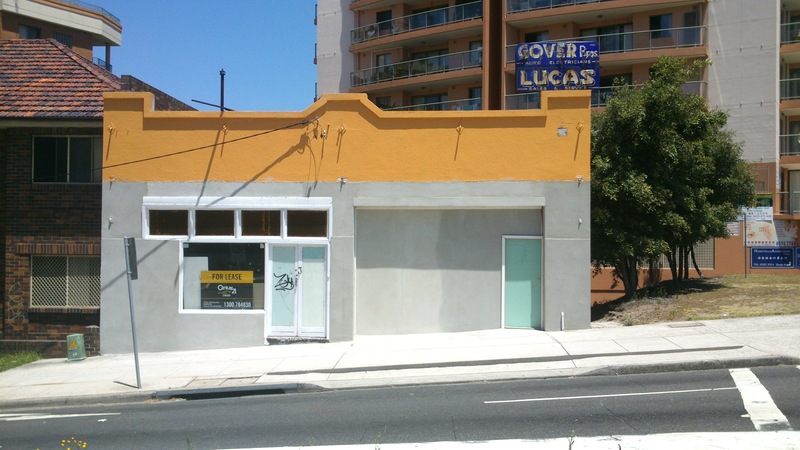 This Art Deco former service station at Tempe is set to disappear. 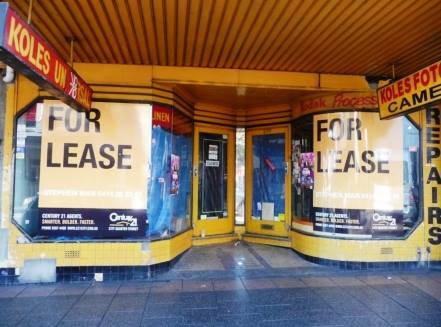 Stunning Art Deco shopfront in Ashfield, set to go. Main title image Daily Telegraph.